Welcome to a new (and hopefully regular) feature on the blog- The Closet Series. One of my resolutions this year is to totally revamp my wardrobe. I’m ready to have a wardrobe I can be proud of. First I’ll need to get rid of all the things that don’t fit or that I haven’t worn in years and start stocking my closet with pieces I really love. And I mean really really love– clothes that I didn’t buy just because they were on sale, clothes that make me feel awesome when I put them on, and clothes that I’ll want to wear for years to come. For a while I’ve felt that some of the pieces I own are too juvenile and I’m ready to upgrade my closet a bit. Not that I didn’t like those items when I bought them, but I think it’s time to move in a different direction. Part of this involves figuring out what I want my closet to look like and head in that direction. I’ve noticed that the outfits I like the most are classic with a little bit of a twist; they’re simple, yet still polished. 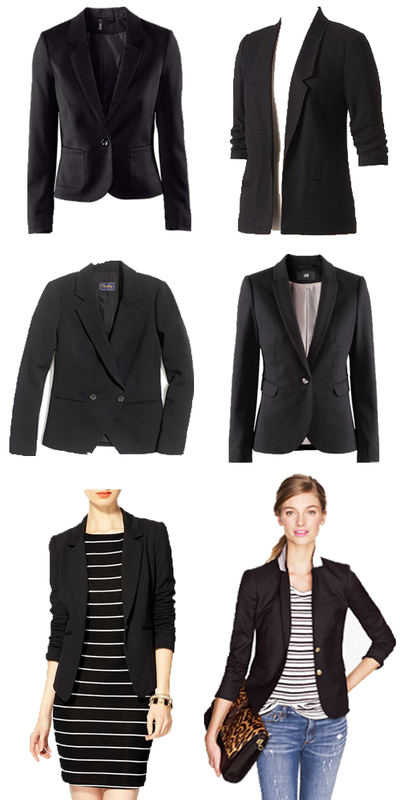 I’m beginning with the basics and first on my list is finding the perfect black blazer. I have a black blazer right now, but the fit is all wrong and I feel that it swallows me up a little bit. However, with the right fit/cut, a blazer is a great way to finish off a casual or dressy outfit. Take a look at some options that have caught my eye above and some inspirational looks below! love it or hate it or somewhere in-between?